These days, everybody wants to be connected all the time. The airline industry, not one to ignore consumers—at least not when the airlines stand to make a buck—are hopping on the onboard-connectivity movement as quickly as they can. Here’s what you need to know. 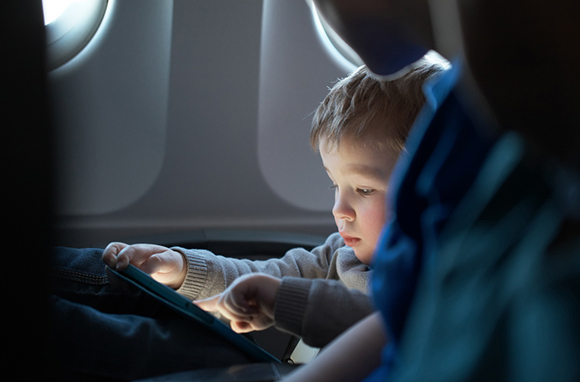 Why is in-flight connectivity so important to airlines? They realize that many of us have withdrawal symptoms when we aren't wired in to the system. Also, a few airline execs have actually confirmed what many suspected: They view a heavy dose of in-flight entertainment as a way of taking passengers' minds off the terrible crowding and lousy service in the main cabin. And, of course, there's always the chance to add another service for which the airlines can ding you for a fee, an option that always gives those execs a warm feeling. For whatever reason, in-flight connectivity, along with flat-bed seats in international business class, is the current big thing in air travel. The assumption that you want to be connected during your flight is so strong that these days you find airline crews lowering the window shades and darkening the cabin as soon as the plane reaches cruising altitude—even during daytime flights. Most big domestic and international airlines have some form of in-flight movies available in all mainline jets and typically also in the newest large regional Embraer 170-195 series. 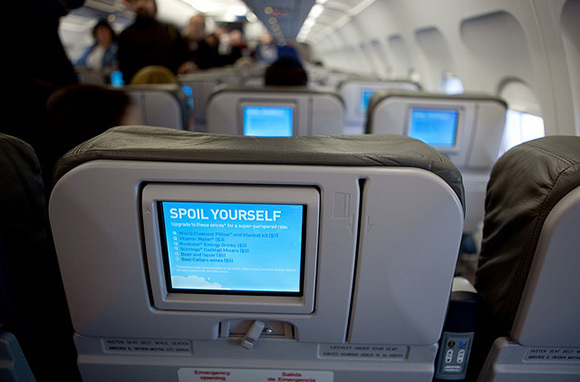 Older jets that airlines plan to retire soon typically still use the original system: screens that drop down from the cabin ceiling and show just one film at a time. But those conventional in-flight movie systems are, as the young would put it, so 20th century. Now the new standard is to offer a wide variety of programming, through some mix of on-demand movies and live multichannel satellite TV broadcasts. New planes almost always come with a multichannel on-demand system. And airlines are retrofitting older jets with similar hardware. Currently, only three North American airlines (other than regionals) offer no in-flight entertainment at all: Allegiant, Porter, and Spirit. 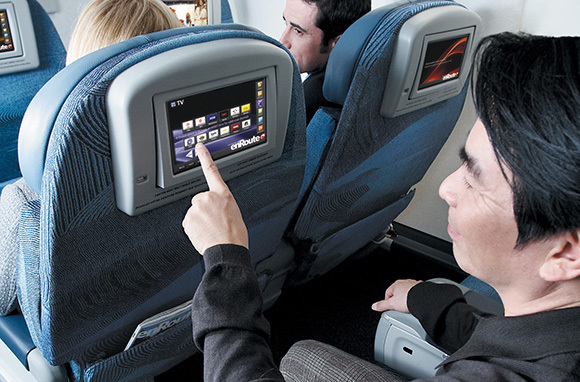 The current standard for up-to-date in-flight on-demand movies delivers programming through either individual seatback screens or handheld tablets. On airlines that use tablets, you can "rent" the device; on a few, you can connect with your own tablet, smartphone, or laptop. Typically, you pay by time or by movie; for folks in the upper-class cabins, this service may be included. 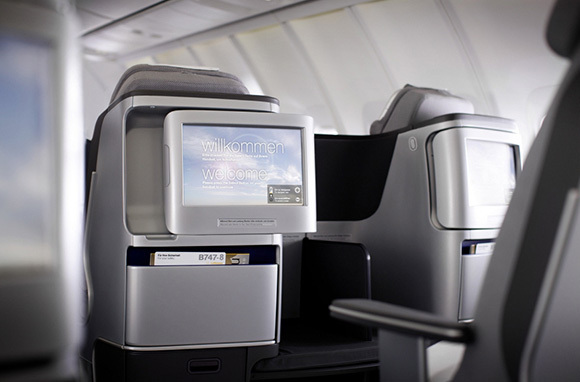 U.S. and Canadian airlines with on-demand movies in economy class on mainline jets include Air Canada (individual seatback screens on all planes), AirTransat (individual seatback screens on 330s only), Alaska (tablets on all planes), American (individual seatback screens on all new and refurbished planes), Delta (individual seatback screens on newer planes), Hawaiian (individual seatback screens on 330s and tablets on 767s), Sun Country (tablets on all planes), United (individual seatback screens on limited planes), US Airways (individual seatback screens on international 330s), Virgin America (individual seatback screens on all planes), and WestJet (tablets on seven planes). Airlines with satellite TV reception on at least some planes include Delta (individual touch screens on some planes), Frontier (tablets on all planes), JetBlue (individual touch screens on 40 planes so far), Southwest (your own device on most planes), United (individual touch screens on almost all 737s and 757s other than PS versions), and Virgin America (individual touch screens on all planes). 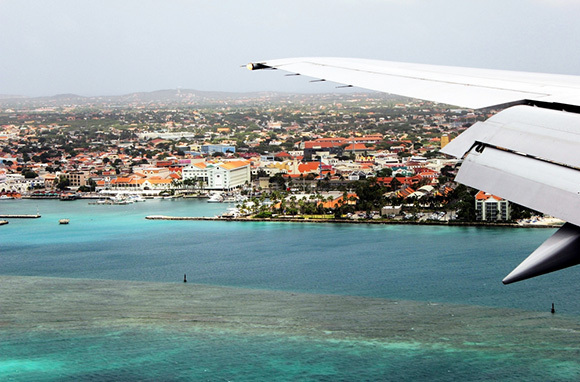 Typical pricing is around $5–6 for a few hours to $8–10 for the entire flight. Although you can get Internet reception on many flights these days, you'll find substantial differences in capability and pricing. Gogo operates through links from the plane to ground stations it flies over along the way. The system architecture mimics cell phone coverage: As the flight moves along, it passes connections, tower to tower, and coverage is limited to flights over land. Currently, Gogo has equipped more than 2,000 planes: Air Canada (planes used for Montreal and Toronto to Los Angeles flights), Air Tran (all planes, but the 717s are being sold to Delta), Alaska (all but nine obsolete planes), American (almost all domestic planes), Delta (all domestic mainline and large regional planes), United (most 320s and all PS 757s), US Airways (all 320s), and Virgin America (all planes). Gogo standard pricing starts at $5 for one continuous hour. The downside to Gogo is bandwidth. You've probably seen some reports of very slow online speeds when lots of travelers are connected. Gogo says it's working to improve bandwidth, but that remains a problem for potential users. Also, Gogo doesn't work until the plane reaches 10,000 feet. Satellite coverage comes in two flavors: the older Ku-band service provided by Panasonic and Row 44, and the newer, faster Ka-band system from ViaSat. Satellite service is available anywhere within "view" of the transmitter, so it can work over oceans as long as they're covered by a satellite. Airlines with some satellite-based Internet include American (777-300s only), Delta (some planes), JetBlue (currently installing very-fast Ka-band on 320s), and Southwest (425 planes so far). The big advantages of satellite Internet are that it's available over water and it provides substantially better bandwidth than ground systems. Additionally, it's available during the entire flight, often even when the plane is on the ground. A minor disadvantage is latency: The signal has to travel 44,000 miles round-trip between plane and satellite, resulting in a noticeable but not really troublesome delay. Typical pricing runs from about $5 per hour to $20 for a full day. JetBlue plans to offer two levels: a low-priced base service and a premium high-speed service suitable for video streaming for $9 per hour. AT&T is reportedly about to launch a service that will provide 4G mobile in-flight connectivity. Like Gogo, it will be ground based, but AT&T is touting high-bandwidth capability. Presumably, the system will build on AT&T's extensive experience with wireless phone technology. Look for it to start sometime late next year. 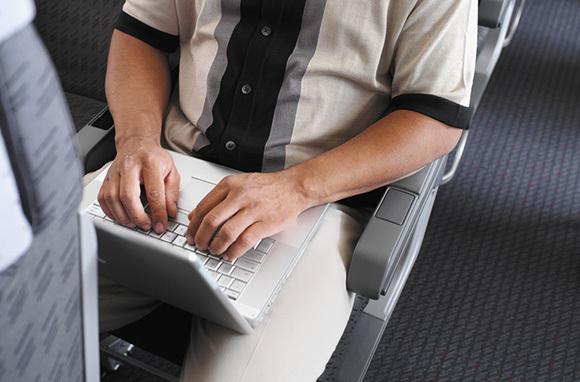 Airlines based in Europe and the Pacific lag behind their North American competitors with regards to in-flight Wi-Fi. They didn't start as early because Gogo, the original system, did not install its ground-based system outside of North America. For long overwater flights, the newer satellite systems are the only available technologies, and as of a little less than a year ago, full-flight Wi-Fi was available on only 29 transatlantic and transpacific daily flights, mostly on Lufthansa and American, with a handful on Etihad and Singapore. Presumably, the big airlines will play catch-up as quickly as they can, and several have announced extensive installations coming within the next year or two. One of the most vexing aspects of in-flight options—especially Wi-Fi—is that most airlines fail to show which flights have Wi-Fi in their initial search displays. Some don't even tell you until you've already bought your ticket, or they suggest that you check the website a day or two before departure to see whether the flight to which you're already committed actually has Wi-Fi. 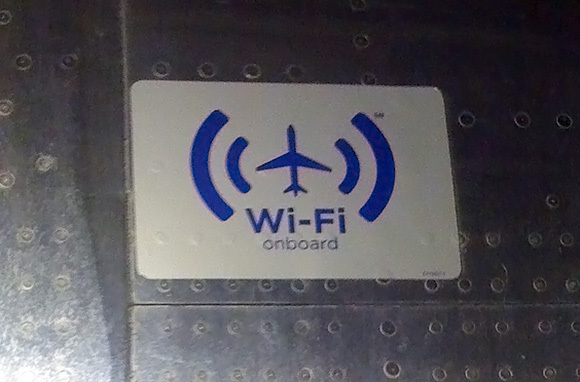 A few carriers just say, "See if the plane has Wi-Fi when you board." Feh! Among the airlines that do offer Wi-Fi, Delta shows availability on its initial search-results page for all flights; US Airways shows Gogo availability on flights on 320 planes, and Virgin America doesn't have to tell you because all flights have it. If you really want to make sure a flight you're considering has Wi-Fi before you buy your ticket, your best bet is to use one of the three big search engines that show Wi-Fi availability for all airlines on their search-results pages: Routehappy and TripAdvisor Flights (our parent company) show Wi-Fi and individual-screen entertainment availability, and Kayak shows Wi-Fi availability on the initial leg of round-trip or multi-stop displays. A test search shows that CheapOair, CheapTickets, Expedia, Google, Hipmunk, Hotwire, Orbitz, Priceline, and Travelocity do not reveal Wi-Fi or personal-screen availability. Southwest, which does not allow third-party search engines to include its fares, does not show Wi-Fi availability on its website. SeatGuru shows availability of Wi-Fi and video by airline and plane model; however, for airlines that have started but not completed installation, SeatGuru does not distinguish planes with and without.